Gabriel (meaning "God is my strength" or "man of God"), in the Bible and Qur'an, is an angel, specifically an archangel (arch means "highest" or "chief"). Gabriel is first mentioned in the Bible, in the book of Daniel, when he appeared to Daniel. 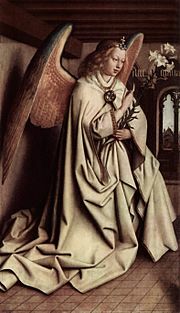 In the New Testament, St. Gabriel appears first in the book of Daniel in the Old Testament, the angel announced to Daniel the prophecy of the seventy weeks. And most famously, to Mary to announce the coming birth of Jesus. The Catholic feast of the Annunciation celebrates this visit every year, nine months before Christmas. The Bible does not say angels have wings, but Christian artists usually show them that way. 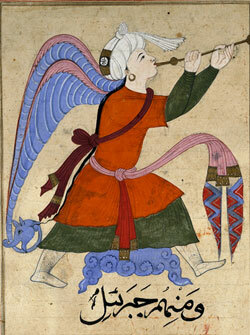 Gabriel (Jibril in Arabic) is a messenger from Allah. He is the angel who tells Mary that she will have a baby boy. Gabriel is one of four names of angels in holy Qur'an. He revealed the Qur'an to the prophet Muhammad. Gabriel has sometimes been used as a given name in English-speaking counties because of a Continental European influence. Cognates: Hungarian: Gábor. Italian: Gabriele. Finnish: Kaapo. The feminine form of the name Gabriel is Gabrielle. Annunciation of Gabriel by Jan van Eyck, 1434. Gabriel on the southern deacons' door of the iconostasis in the Cathedral of Hajdúdorog, Hungary. Gabriel Facts for Kids. Kiddle Encyclopedia.